Mobile’s momentum has not slowed down yet, as new data shows that Web traffic from mobile and tablet devices jumped 50 percent over the past year. The data, from online marketing company Wpromote, found that non-desktop traffic made up 27 percent of visits in the first quarter of 2014, which is a significant increase from last year’s 18 percent. Moreover, smartphone traffic increased from 11 percent to 17 percent, while tablet traffic increased from 7 percent to 10 percent. As a result of the increasing mobile traffic, desktop traffic has declined. In fact, Wpromote’s data shows that desktop Web traffic decreased from 88 percent in the first quarter of 2012 to 73 percent in the first quarter of 2014. Wpromote’s data was derived from analyzing traffic to 35 client websites across the e-commerce, business-to-business (B2B) and consumer services industries. Out of these industries, 83 percent of B2B tarffic is from desktops, followed by 70 percent of e-commerce traffic and 66 percent of consumer services traffic. 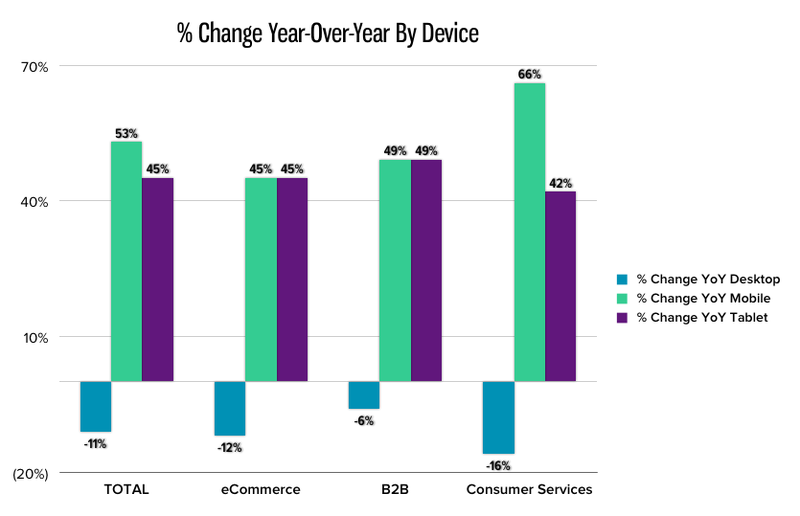 It is also important to note that the data found more than 12 percent of all traffic to e-commerce sites comes from tablet devices, which is the highest of all the industries.